11 This isn't an April Fool's joke! 17 Have a Fun (Stuff) Holiday! 22 Not busy enough with the Awards? Don't worry, Fake News is here for you! 25 When there's something strange...on your talk page...it's probably the Fake News. 29 A Very Fun Stuff Christmas! 35 Who Cares About Outdoors When You Can Write Your Pipe Plaza Section? 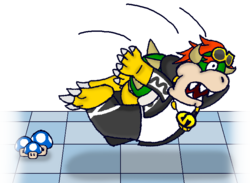 This is Lord Bowser, giving you a heads-up that your section(s) are due by September 14th. Please PM me your completed section on the forums by then. If you need an extension, don't be afraid to ask for one, though please try to do so in good time. 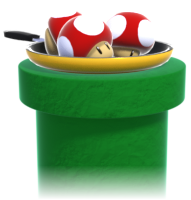 Please PM Super Mario Bros. and Gabumon your 'Shroom section on the forums (our forums, which one did you think?) by no later than November 9th. Please remember to save a copy in your outbox. If you can't, be sure to tell us soon and we'll be sure to punish you cruelly work something out. Please send me (MCD) your Fake News section(s) by 14th June. If you are unable to submit your section in time, please tell me as soon as possible, and I'll sort something out. Not busy enough with the Awards? Don't worry, Fake News is here for you! Please send me (MCD) your Fake News section(s) by August 11th. If you are unable to submit your section in time, please tell me as soon as possible, and I'll sort something out. I've sent you an application form for the Picross section over the forums (forgot to put a subject in, though). I hope you read it! This is your cue to get your sections done and sent to me through our forums by November 14. If you can't make the deadline and you have a valid reason for doing so, get in touch with me as soon as you can and we'll work it out. This is your cue to get your sections done and sent to me through our forums by January 16. If you can't make the deadline and you have a valid reason for doing so, get in touch with me as soon as you can and we'll work it out. This is Lord Bowser, giving you a heads-up that your section(s) are due by February 13. Please PM me your completed section on the forums by then. If you need an extension, don't be afraid to ask for one, though please try to do so in good time. Please send me (MCD) your Fake News section(s) by February 14th. If you are unable to submit your section in time, please tell me as soon as possible, and I'll sort something out. Who Cares About Outdoors When You Can Write Your Pipe Plaza Section? This is your cue to get your sections done and sent to me through our forums by July 16. If you can't make the deadline and you have a valid reason for doing so, get in touch with me as soon as you can and we'll work it out. This page was last edited on July 11, 2016, at 17:41.